Visitng the Southern Terminus; Just in case I don't make it this far! You can make the best preparations possible, fine tune everything to the minutest detail, but, at the end of the day, you are always at the mercy of the weather. Sitting off the south-west coast of Australia, in the mighty Southern Ocean, there have been a monotonous succession of low fronts that, for August and September, have led to strong winds and heavy showers. This unusual prolonged spell has caused a multitude of problems on the track. In the south, there has been extensive flooding and what was once a warning of wading waist deep on sections has turned into a full diversion of the area around Lake Maringup. The southern coast has taken a battering and all the inlets appear to be too high to cross, and very lengthy road diversions are in place. Some of the beaches are also a no go thanks to the violent storms eroding them. Meanwhile, parts of the north has seen damage, such as collapsed walkways, and more diversions; It's all looking a bit grim at the moment. Despite this, my preparations continue with my Friday start time still planned. It'll take a weather warning advising against setting out on the track to change that; there was one such warning just last week! I am currently in Albany, at the end of a first day of three on the road, delivering food parcels to the track towns. 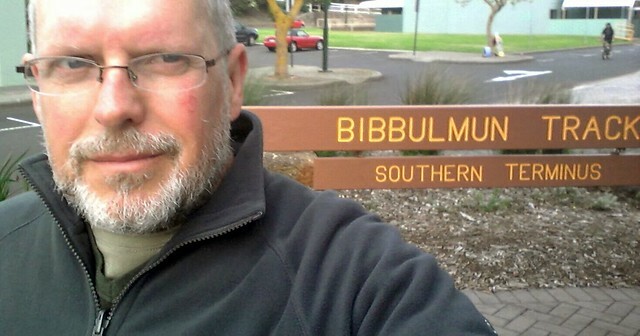 Whilst here, I couldn't resist the opportunity to visit the end of the track; the Southern Terminus, just in case! There is time, though, for things to improve. This weekend promises a respite, and hopefully a sign that Spring may have finally come to this part of the world. The conditions underfoot will still be soggy but a stretch of dry should soon make it an easier traverse. The worst hit southern sections won't begin to matter for a number of weeks yet, so there is opportunity for the water to go. On the plus side, I shouldn't be going short of drinking water for the next few weeks! Tomorrow, I should get an inkling of the extent of the problems down here, when I drive along the south coast to Denmark and Peaceful Bay, before heading in to Walpole, Northcliffe, Pemberton, Donnelly River, Balingup, and Collie, where I will overnight. Day three, I will drop my final parcel off at Dwellingup, and then head back to Perth for the final tweaks. Safe to say this is not how I envisaged this adventure beginning, but looking back, I have often been dogged by rain in the "Sunburnt Country". Three times to Uluru and never seen a sunset, saw the Todd River flow through the town of Alice Springs, and witnessed Lake Eyre, in South Australia, being at its fullest in living history! I think it's about time the Weather Gods cut me some slack!